6 “Mix & Match” Michigan Golf Getaways! Southwest/Western Michigan is an easy drive from Chicago and surrounding areas for fantastic golf getaways. “Must-play” courses this summer include: Whittaker Woods Golf Club, Ravines Golf Club, HawksHead Links, Macatawa Golf Club, LYNX GC and Heritage Glen Golf Club. All are perfect for a buddies golf trip or a couples stay and play. They offer great patios, spectacular views of the course, and fantastic dining options. LYNX GC has one of the best views for evening sunsets from their outdoor patio or The Grill overlooking the Kalamazoo River. Whittaker Woods, located in New Buffalo, has a newly-built, beautiful spacious outdoor patio for dining and watching golfers approach the 18th green. The Four Winds Casino New Buffalo located 5 minutes from Whittaker Woods, makes it the perfect choice for hotel accommodations. HawksHead Links houses The Inn at HawksHead and their fabulous restaurant …. and now they offer two great vacation cottages with 4 bedrooms and 4 bathrooms in each for on-site “stay and play” getaways! Heritage Glen Golf Club, minutes from downtown Paw Paw, is a scenic and well-manicured golf course that’s a playable challenge for every skill level, winding through thick forestry and streams in the heart of wine country. 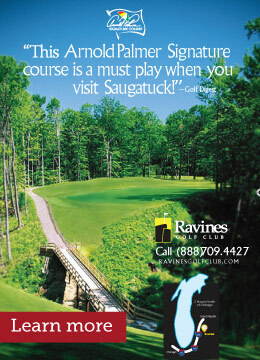 Saugatuck’s Ravines Golf Club is the only “Arnold Palmer Signature Golf Course” in Michigan—a spectacular and challenging golf course with deep ravines and groves of towering trees. Macatawa Golf Club, a pristine golf course community in Holland, Michigan is now part of the Watermark Properties collection, recently purchased by them. If you’re looking for a great West Michigan golf experience you could not do better than Ravines Golf Club, located in beautiful and historic Saugatuck, Michigan. The natural beauty and challenge of the “King’s” finest West Michigan golf course awaits your arrival. The professional staff at Ravines is eager to help your group book the perfect golf trip. Whether you’re looking for a simple drive and play, or extended multi-day golf experience we can help make it happen. Planning your golf trip could not be easier or more rewarding. Call now for more information at (269) 857-1616 or visit www.ravinesgolfclub.com. Heritage Glen, built in the mid 1990s, has long been acclaimed as one of Michigan’s most scenic courses, set in a well-forested setting in the heart of the state’s wine country. Architect Jerry Matthews has used this landscape to great advantage, creating intriguing holes with a great amount of variety and opportunities for golfers of all levels to test their skills. It’s a player-friendly, yet challenging, course that offers great scenery along the way. On some holes, thick with pines, you’ll feel as if you’re in the Northwoods; on others, wide-open fairways have a taste of Scottish links design. An easy drive from Chicago just off Interstate I-94, Heritage Glen is the perfect location to drive up for the day with your group! Call (269) 657-2552 or visit www.heritageglengolf.com for group events and getaways. The LYNX is one of the most scenic golfing experiences in Southwest Michigan. Conveniently located to nearby Kalamazoo, Holland or Grand Rapids markets, The LYNX is a daily-fee golf course, open to the public seven days a week. Both nines begin and end at the highest point on the course, about 90 feet above the valley floor of the Kalamazoo River. The front side sends you out and concludes with a short, uphill dogleg left par 4 measuring 353-yards. The backside features the course’s signature hole, No. 10, a par 4 of 411 yards that boasts an 85 foot elevation drop from tee to fairway. The LYNX GC, nestled along the scenic Kalamazoo River amidst rolling terrain and tree-lined fairways, offers a unique venue for weddings, special events, and family gatherings. Golfers can enjoy a great round on the scenic LYNX golf course, drinks & dinner, and a spectacular sunset on the relaxing outdoor patio. Come out for a delicious lunch, dinner or hearty Sunday breakfast in the well appointed LYNX Grill. Visit LYNXGC.com for events this season, that will include a Couples “Golf, Wine & Dine” Event featuring 18 holes of golf and dinner with a “two for one” entrée special on select dates. One of the absolute best places for a weekend getaway by the beach or a corporate golf retreat is the New Buffalo, Michigan area. It has everything possible for a great retreat – business or pleasure – including wonderful restaurants, the Four Winds Hotel & Casino, quaint shops, the beachfront and more! Come play Whittaker Woods, designed by the legendary Ken Killian, and one of the most popular courses on the GolfVisions Golf Trail. Carved from woods and wetlands, Whittaker Woods offers both spectacular golf and immersion in nature, nurturing your love of the game and delighting all your senses. Whittaker Woods is located in southwest Michigan’s charming Harbor Country and is a “must play” on your pure Michigan golf adventure. Yet Whittaker Woods is definitely part of the Chicagoland golf scene at just 90 short minutes from downtown Chicago and literally steps from the Indiana state line. For more information, visit www.golfwhittaker.com or call (269) 469-3400. With leagues, lessons and fun for newcomers and pros alike, Macatawa Legends is your premier destination for golf in West Michigan. Macatawa Golf Club is a championship 18-hole golf course and club, located ten minutes north of downtown Holland, Michigan, and five minutes from Lake Michigan. Award-winning golf course architect Ray Hearn designed and shaped this beautiful golf course near the shores of Lake Michigan. Macatawa Golf Club is known as an ever-changing course based upon the elements of each particular day. Macatawa Golf Club also features a stunning clubhouse, an executive fitness club, a family swimming pool facility, and tennis courts. 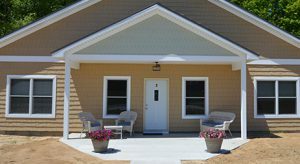 HawksHead Links New Vacation Cottages! For more information, visit www.hawksheadlinks.com or call (269) 639-2121.